This post will cover deploying an instance of SuiteCRM to Digital Ocean from creating the droplet to logging into SuiteCRM. If there’s enough interest I’ll do similar guides for other hosts. First you’ll need a Digital Ocean account. If you don’t have one it’s easy to create one. From the droplets page of your account we’ll click on the “Create Droplet” button. Give our new droplet a name - In this case “MySuiteCRMInstance”. Choose a size - I’ve went with the smallest, sizes can always be increased as needed. Choose a region - It’s best to choose a region closest to the users of the instance - London for me. Choose an image - I’m going with Ubuntu 14.04 which is the current Long Term Support release. Optionally you can add extra settings such as backups and add SSH keys (which is recommended). Finally we can create our droplet. When this is done you’ll see a progress page, creating the droplet is usually pretty quick. When this is complete you’ll be shown the droplet details page and receive an email with the details of your droplet. You can now ssh into your droplet. 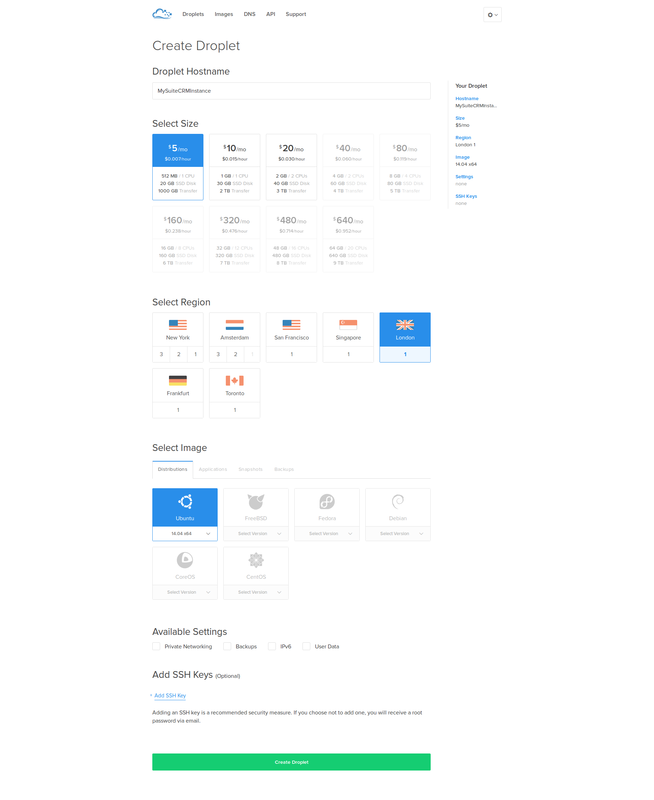 For simplicity we’ll use the “Console Access” option on the droplet details page. You will need to change your password. Now is also a good time to create a new non-root user. 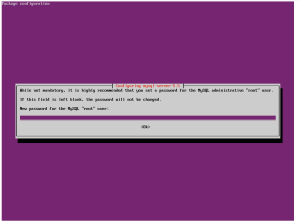 Now we have a fresh Ubuntu install we can begin setting up our environment for SuiteCRM. This will prompt you to update packages. Agree with “Y”. Apache - The web server that will serve up SuiteCRM. PHP5 - SuiteCRM runs on the PHP programming language. APC - An (optional) PHP addition which will provide caching and speed up SuiteCRM. Again you will want to agree to the install by pressing “Y”. 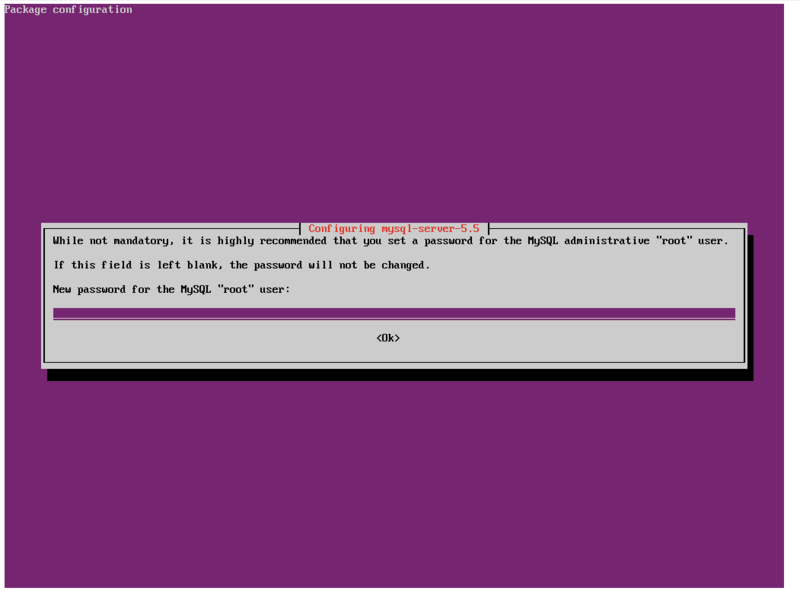 You’ll be prompted to supply a password for the MySQL root user, do so now. Click next and a page detailing what SuiteCRM will need for the install is displayed. Double check this screen but we should be good to go. Once again click next. Next up will be the licence page. 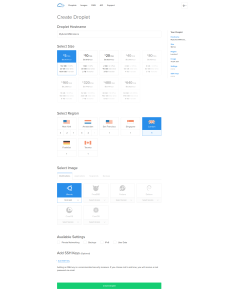 SuiteCRM is open source and is licenced under the AGPL. Accept this and click next. This will prompt a system check which should pass. We’ll be presented with an option to do a custom or typical install. These are pretty similar so we’ll go with typical for simplicity. Next we’ll be prompted to choose a database type. Our only option is Mysqli so choose that and click next. Next we’ll provide the actual database configuration. 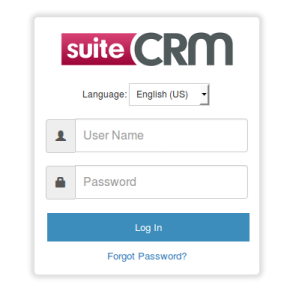 Give your new database a name, I’ve imaginatively went with “suitecrm”. Provide the host for the database, since we’re running the database locally we can go with “localhost”. It’s good practice to create a separate user for the SuiteCRM database so we supply a username and password for this. You can also optionally populate the database with demo data. Next up we provide the admin user for SuiteCRM. After this SuiteCRM will complete the install process and provide some details. Enter your username and password and you’ll be all set! Have any issues? Let me know in the comments.